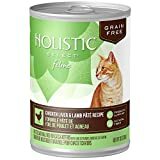 If you have been trying to find the best cat food for sensitive stomach for your kitty, you have come to the right place. Give me the right food! Cats are typically known as finicky eaters. The aroma, taste, and texture of a food are more important to them than the nutritional level. However, as their owner, you’ll want to think about the food’s nutritional level. This is especially true when you have a cat with a sensitive stomach. Understanding that your cat isn’t only finicky but that he also has a sensitive stomach means that you must find the right food for him. Fortunately, there are several different foods that you can try with him. These are specially formulated to meet his nutritional needs, fit his finicky personality, and not upset his delicate stomach. The food has a lot of omega-6 fatty acids that help nourish your cat’s skin and coat. The blend of antioxidants and nutrients support your cat’s healthy immune system. There are no artificial colors or preservatives so it’s easier on your cat’s stomach and digestive system. Brewers rice is a carbohydrate that your cat can easily digest. It’s also a good source of fiber. Pork meal is a neutral protein, which is why it’s great for cats with allergies. It also provides them with zinc and the B vitamins they need. Eggs contain amino acids which help build healthy muscles and organs. Purified oat fiber is extracted from oat hulls because it’s a great source of fiber – both soluble and insoluble. happy, healthy life – even if he has some digestive issues. For this reason, they’ve created food that has a natural fiber blend combined with high-quality protein. This type of food is great for supporting healthy digestion in cats who have digestive sensitivities. Since there aren’t any artificial colors, you won’t compromise when it comes to feeding your cat complete, balanced nutrition. It also has 25 essential vitamins and minerals to give your cat 100% of everything he needs. You’ll never have to worry about whether your cat likes how this food tastes either. Cat Chow monitors the entire process to make sure your cat will enjoy it. While various recipes are available, you can rest assured that they all contain precisely what your cat needs for a great coat, plenty of energy, and a strong immune system. All of this is available without any other preservatives either. Instead, the recipe features real meat, whole grains and lots of vegetables. So, not only can you manage your cat’s special needs, but you can do so while feeding your cat a food they will think tastes great. Pumpkin can help regulate your cat’s digestion. Spinach has quercetin, which is a phytochemical that has antioxidant properties. Cranberries and Blueberries contain powerful antioxidants that support your cat’s immune system and urinary tract health. The high-quality protein helps your cat build and support strong muscles. It also aids in their healthy digestion of the food. The omega-3 and 6 fatty acids help your cat develop healthy skin and a shiny coat. The essential vitamins, chelated minerals, superfoods, and antioxidants help support your cat’s immune system. The taurine helps your cat have healthy eyes and a healthy heart. The calories are carefully balanced so your cat maintains a healthy, ideal weight. The grain, probiotics, and FOS prebiotics soothe your cat’s stomach, promote good digestion, and help him absorb the nutrients he needs. The amino acids give your cat the fuel necessary for his playful side. food you buy is real lamb, poultry, or fish. The ingredients that follow this include rice, oatmeal, and chicory root. These ingredients are all good choices when you want a cat food that’s easy on his stomach, regardless of his size, age, or lifestyle. The easily digestible ingredients in this cat food were chosen to help your cat thrive. This food has a lot of wonderful benefits to it, all of which come from the great ingredients it has. For this reason, it’s worthy of your consideration here. Pumpkin is a natural source of vitamin A, beta-carotene, potassium, and dietary fiber which your cat needs for maintaining a healthy immune system and soothing his upset stomach. Cranberries contain a lot of vitamin C which prevents harmful bacteria from thriving in your cat’s urinary tract. Papaya has a lot of vitamin A, C, and E that supports your cat’s digestion. It’s also high in protein, which is beneficial to your cat’s intestinal tract. Dried beet pulp is a great source of insoluble fiber which is important for healthy digestion. It also stimulates probiotics’ growth. Ground flaxseed has a lot of Omega-3 fatty acids that improve your cat’s coat. It also has a lot of fiber that helps move food through their digestive system. Cinnamon supports a calm, balanced digestive tract without any fungus or inflammation. made with only the simplest of ingredients instead of the crazy list of ingredients that most cat foods contain today. These pure, simple, raw foods give your cat the essential nutrition he needs to thrive with a taste that he’ll truly enjoy. With only one animal protein and one vegetable, this food is great for even the most sensitive stomach. 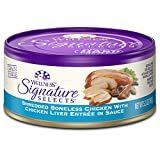 Since the protein comes from cage-free poultry or farm-raised rabbit, you can rest assured that this easily digestible protein is also packed full of flavor your cat will enjoy. You also don’t have to worry about this food ever containing any artificial ingredients, beef, fish, corn, eggs, grain, potato, soy, or wheat – all common allergens for cats. Pure, real nutrition is packed into this pâté. 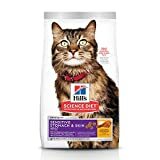 It’s then crushed and freeze-dried to protect the flavor until your cat is ready to enjoy his meal. Now not only is the nutritional bar raised but so is the flavor bar. Boneless chicken is the main source of protein. It provides the essential vitamins and minerals that your cat needs. Sunflower oil gives your cat the calories he needs for producing energy. 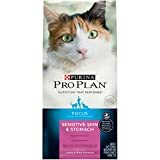 It also has alpha-linolenic acid, which is an Omega-6 fatty acid that your cat needs so that he can have healthy skin and a shiny coat. Skipjack tuna is another really healthy protein. It also has a lot of Omega-3 fatty acids, including DHA. Whole, cooked, dried eggs are another great source of protein. Turkey provides essential nutrients and omega fatty acids. These meats are carefully sourced then packed by hand so that you can rest assured of their high quality. Sunflower oil is used because it has a lot of essential fatty acids that help your cat have a healthy coat. This food will not only nourish your cat, but it will also help hydrate him. This is important for his urinary support. There are never any meat by-products, corn, wheat or soy to upset your cat’s stomach. Artificial colors, flavors, and preservatives also aren’t used. Digestive issues typically result from your cat having a sensitive stomach. Common signs that your cat is suffering from such an issue include vomiting, regurgitation, flatulence, weakness, and diarrhea or constipation. Although these conditions will usually clear up in just a few weeks, in more severe cases this won’t happen though. This is usually because your cat is suffering from something more severe such as acute gastroenteritis, colitis, pancreatitis, Irritable Bowel Syndrome (IBS), exocrine pancreatic insufficiency, or small intestinal malabsorption. Changing the cat’s food is imperative in such cases of sensitive stomach. When you need to switch your cat to a sensitive cat food diet you’ll want to make a gradual transition if possible. This works best when you can mix his current food with his new food then gradually cut down on the amount of the current cat food you give him. At the same time, you’ll want to increase the amount of the new food you give him. Typically this takes about 7 days, but if you have an older cat or one that’s particularly finicky, it could take up to 10 days. Ask your veterinarian for advice here because if your cat has acute gastrointestinal issues, you may have to immediately switch the foods and wait for your cat to take a liking to his new food. What your cat eats significantly impacts the health of their GI tract. Although numerous nutritional approaches are available here, the main goal is to alleviate your cat’s vomiting and diarrhea. This is why veterinarians recommend feeding your cat food that he can easily digest without further irritating his already sensitive stomach. Dry food is usually best for your cat, but since you want him to stay hydrated, you may need to supplement it with some wet food too. Oftentimes this is something you’ll need to manage for the long-term.